Everything was excellent. The owner was amazing and very helpful. Unobstructed view of the Mediterranean. Easy access to Promenade and beach without moving car. Parking on property rather than street. Lots of water pressure in very well appointed bathroom. Kitchen also very well equipped. We were only there for 2 days, but a family could stay very comfortably. Good spot to do day trips to many sites. The host was a sweetie, met us at the train station even though our flight was delayed and we arrived in the middle of the night. The accommodations were a dream, 5 minute walk into town, private parking space, great AC, extremely secure, out of this world view from all corners, lots of extras, very reasonably priced. Fresh penthouse with huge open space and a lot of home facilities. Not far from the good beach. Owner was very attentive. Просто потрясающие апартаменты, есть абсолютно всё, можно жить месяцы. При заселении нас ждали в холодильнике вино, Кока кола, водичка, пиво, на кухне чай, кофе, печенье. Очень чисто, всё новое, удобные кровати, уютно, даже не хотелось выходить из дома. Тераса просто шикарная с лежаками и барбекю. Сам дом новый, всё охраняется, собственный паркинг. Необыкновенный хозяин, приветливый, позитивный, всегда на связи, был готов прийти на помощь в любую секунду. Нам очень понравилось! קרבה לים, חוף "גלי ים" בעיקר שהתגלה כגן עדן לילדים - מוצלל ובגובה של בריכת ילדים. קירבה לסופר, מאפיה ועוד. 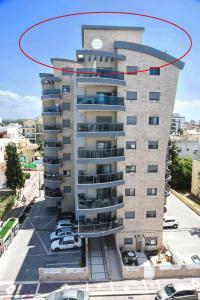 אפשרות להנות משקיעה ומזריחה באותה הדירה. בעלים קשוב שידע לסייע במידת הצורך. המטבח היה מאובזר עד לרמה של נייר אפיה. קירבה לעכו. אהבנו את הדירה. היא מקסימה, נוחה, מאובזרת. נראה שחשבו שם על הכל! כל כיווני האויר, הכל במקומו, תאורה מקסימה, מרפסות נהדרות, מטבח מאובזר. מקלחת מפנקת, המון מגבות. אפילו קפסולות למכונת הקפה וחלב! שבנו אל הדירה בפעם השנייה ונהננו גם הפעם מהדירה המטופחת והנעימה, מהמרפסות, מגינת צמחי התבלין והמתקן למנגל שבמרפסת ומהמטבח המאובזר ומוצרי הטואלט שבחדר הרחצה. הדירה קרובה במרחק הליכה למרכז נהריה - חנויות, בתי קפה ומסעדות, תחנת הרכבת, חוף הים והקניון. Lock in a great price for Spacious Penthouse in Nahariyya – rated 9.7 by recent guests! Located in Nahariyya,10 minutes' walk from the beach and Ga'aton street, this air-conditioned apartment features free WiFi. 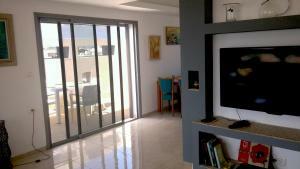 Spacious Penthouse in Nahariyya features views of the sea and free private parking. There is a seating area and a kitchen. Towels and bed linen are available in this self-catering accommodations. 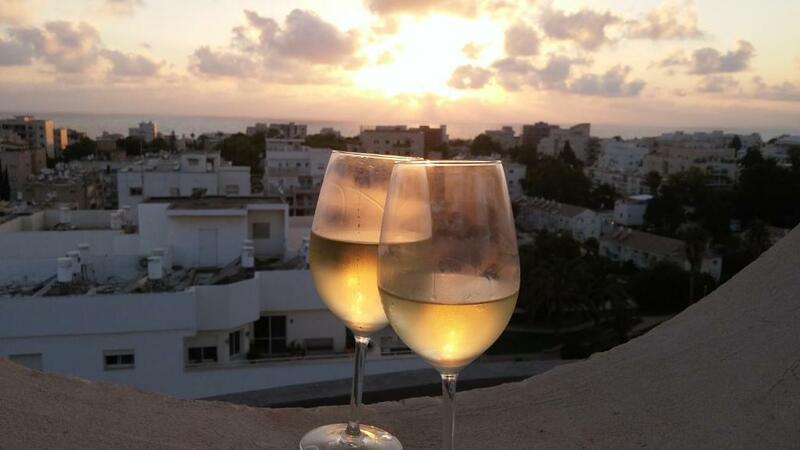 Ga'aton River is 1,950 feet from Spacious Penthouse in Nahariyya, while Sokolov Beach is 2,300 feet from the property. This property also has one of the top-rated locations in Nahariyya! Guests are happier about it compared to other properties in the area. This property is also rated for the best value in Nahariyya! Guests are getting more for their money when compared to other properties in this city. 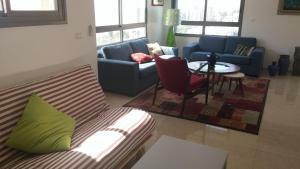 When would you like to stay at Spacious Penthouse in Nahariyya? 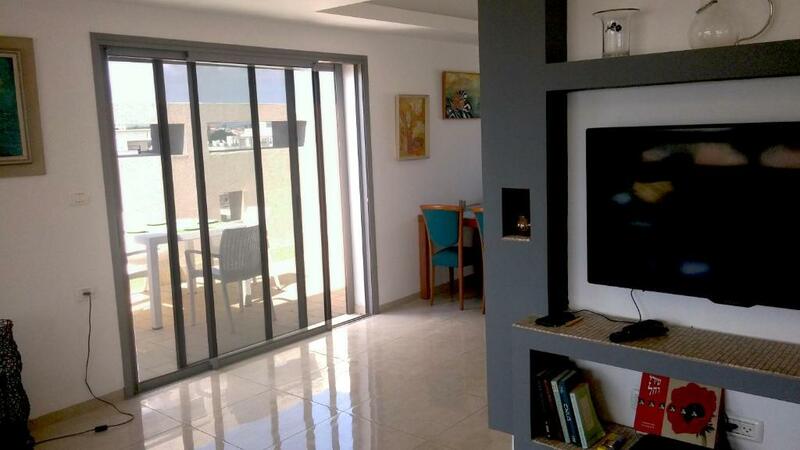 Featuring 2 furnished balconies and a spacious living area, this apartment includes a fully equipped kitchen with an oven and espresso machine. 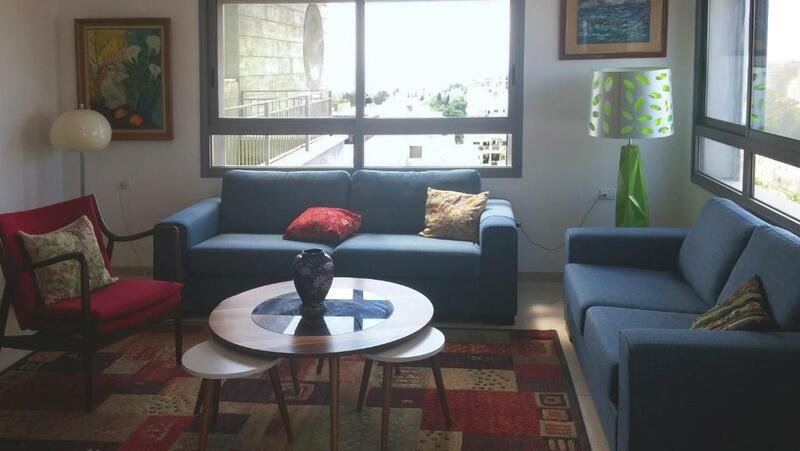 Penthouse heart of Nahariya is a new and modern building. The apartment on the 8th floor, floor unit, with private lobby. Flat area about 95 square meters plus a huge balcony area of approximately 110 square meters, and an additional terrace adjacent to the kitchen area of about 14 square meters. The apartment is equipped and equipped for any purpose, carefully furnished. Huge kitchen equipped electric stove, oven, microwave, espresso machine and so on. TV in the living room and bedroom. In the bedroom extra large double bed (180/200) and a large closet, includes bedding replacement. Every balconies garden furniture and sunbeds. Apartment in a private garage. There is a seating area and a kitchen. Towels and linens are available in this self-catering accommodation. 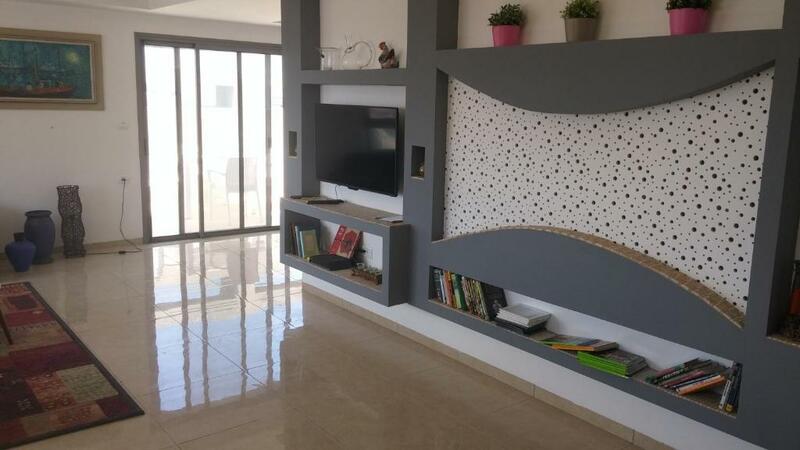 House Rules Spacious Penthouse in Nahariyya takes special requests – add in the next step! Spacious Penthouse in Nahariyya accepts these cards and reserves the right to temporarily hold an amount prior to arrival. Please inform Spacious Penthouse in Nahariyya of your expected arrival time in advance. You can use the Special Requests box when booking, or contact the property directly using the contact details in your confirmation. Only one bathroom and second bedroom could not accommodate a second couple if two couples wanted to travel together. The parking lot was a bit small for a family car and I had to maneuver several times to park.